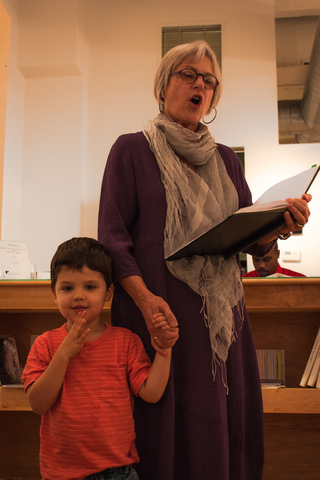 Some help from Max at the Bromfield Gallery, Sept. 2013. Mr. Hip Presenta at the Bromfield Gallery, Sept. 2013. Dinner with Emerson was published in 2016. You can order a copy from the publisher, Tiger Bark Press, from Amazon, or from your favorite independent bookstore. Dinner with Emerson received a "Poetry Must Read" Award (2016) from the Massachusetts Center for the Book. Interview at Garden of Words. Garrison Keillor read poems from Dinner with Emerson on The Writer's Almanac: "The Public Garden," April 1, 2017; and "Favorite Uncle, " August 19, 2016. "Early Storm," which appeared in The Delmarva Review, and "Russian Novel," which appeared in Solstice, were nominated for inclusion in The Pushcart Prize: Best of the Small Presses. Mnookin's poems are included in two new anthologies, Going Down Grand: Poems from the Canyon, and The Well-Versed Parent: Poetic Prescriptions for Parenthood. Thanks to Peter Anderson and Rick Kempa for the their editorial work (and perseverance) on the Canyon book, and to Jane Hunter for the parenting poems.